This recipe is only slightly adapted from Giada. It was one of the first recipes I tried when my husband and I lived in Pasadena and we hadn’t yet had kids (though Matthew was cooking.) We really liked Giada’s original version (I have this thing where I really like to try recipes as they are written before I go crazy and change anything) but there were just a few things I noticed right away. First, her recipe calls for a cheese sauce which even though it’s delicious, it’s definitely not the healthiest choice. My stomach tends to be a tiny bit sensitive to overly-fatty dishes and while I enjoyed her version, I didn’t feel the greatest after eating it. Secondly, the fontina cheese that the recipe calls for isn’t cheap and yes, I know cheaper isn’t always better, but if I can do cheaper and healthier…well, that’s what we tried to do. And finally, she’s an amazing chef and willing to go the extra mile to have a dish not just turn out delicious, but look pretty too. Me, I’m just trying to get dinner finished before anyone in my family kills each other because we all have the grunchies (grumpy+munchies.) Since the whole lookin’ good on the plate isn’t my first priority, I take just a few shortcuts that save time and really, don’t actually mess with the presentation too much, which I thought might be helpful to post. Anyway, back to the recipe. I start with the sauce first. 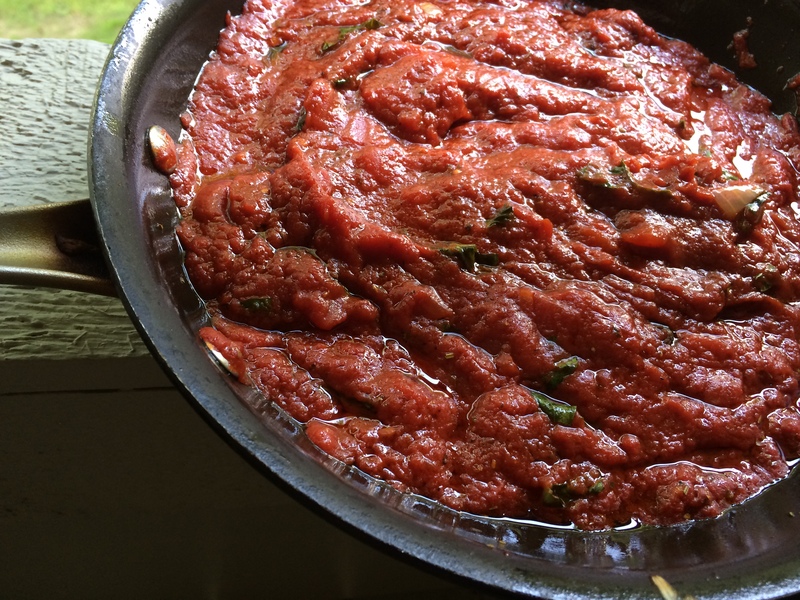 This is the same marinara sauce I use for my lasagna and chicken parmesan. It’s easy to make and delicious. Drizzle the pan with olive oil and slightly cook the garlic. Then add the rest of the ingredients and bring the sauce to a boil. Turn down to warm while you make the rest. I start boiling the water for the manicotti. You’ll need one box or about 12 shells. Then I make the filling. Chop the leaves into 1-inch pieces. In a large nonstick skillet, heat the oil over medium-high heat. Add the onion and cook until soft, about 5 to 7 minutes. Add the garlic and cook for 1 minute longer. Add the chard and cook, stirring constantly, until wilted, about 2 minutes. Allow the mixture to cool slightly. 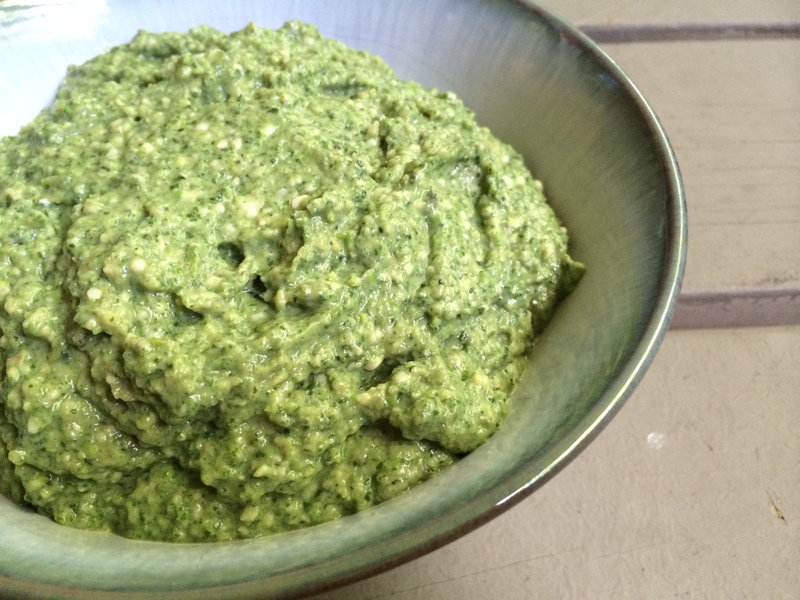 Place the ricotta cheese, peas, mozzarella cheese, Parmesan cheese, basil, salt, and pepper in the bowl of a food processor. Add the cooled chard mixture and blend until smooth. Now is a good time to preheat the oven to 375 degrees. 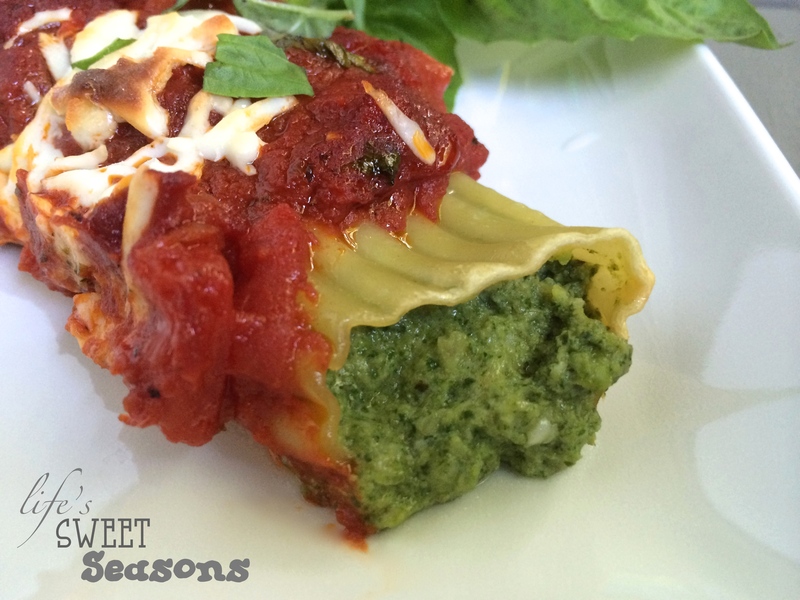 At this point Giada recommends using a pastry bag to put the filling into the manicotti. Honestly, that takes too much effort and makes an even bigger mess. At out house I’m less worried about presentation and more worried about speed. Around dinner time each night I’m trying to feed a starving family who all have the grunchies (grumpy+munchies) which doesn’t make any of us fun to be around. This is where my shortcut comes in. 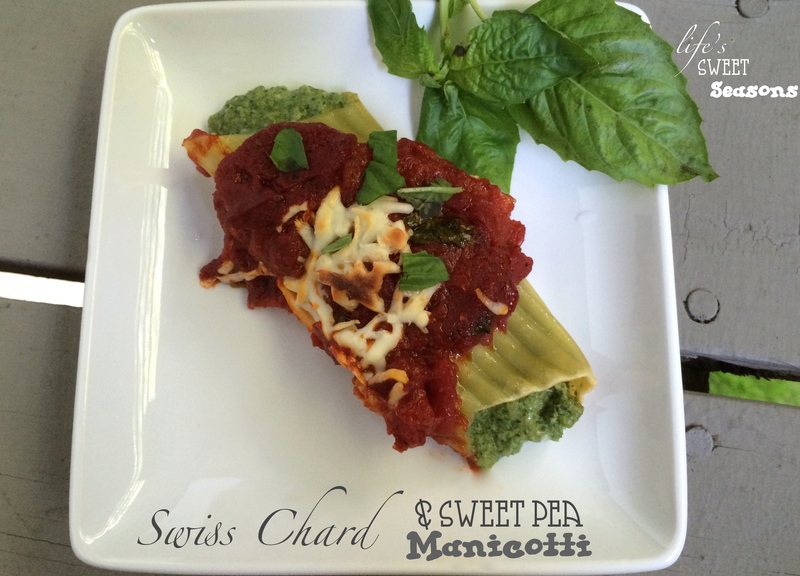 I use a knife and slice each of the manicotti in half lengthwise. Then I just add a spoonful of the filling and press it together and flip it over leaving the cut side down. I’ve made this dish countless times and the filling is thick enough that it doesn’t come out while baking. At this point you could add shredded rotisserie chicken if you wanted. After cramming all the manicotti in there and adding the sauce on top no one will ever know you took the easy way out to stuffing your manicotti shells. 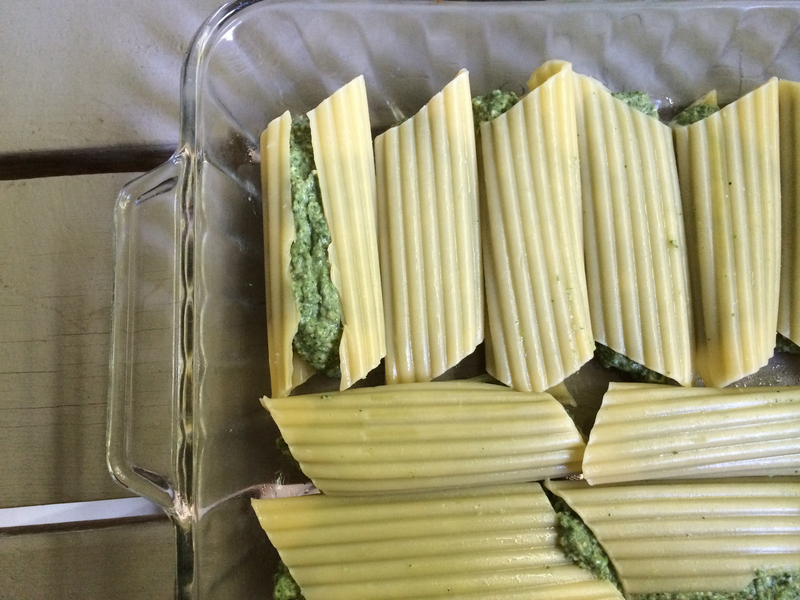 🙂 The picture shows how I’ve stuffed all the manicotti but have not yet flipped over the one on the left. Now spoon the sauce over the top and sprinkle on your desired amount of mozzerella cheese. Bake for 30-35 minutes or until the cheese is golden. PS- The great thing about this recipe is that it can be made in stages. It’s easy to whip up the filling or sauce earlier in the day (or even the day before) so that there isn’t as much prep work the night you’re planning on having this for dinner, which is ALWAYS a plus. 🙂 Happy eating!